I asked support (Urs) about this problem, but he was not able to help me out. I hope someone encounterd this problem as well and can help me. ... and no errors or warnings are logged in the log file. Everything looks like usual. One idea that came to my mind this afternoon: Have you already checked the colors? Maybe they are all 'transparent'? I know this is vague but worth to check. Colors are default. The active com freqs are not displayed as well. Must have something to do with each other. Does the EFB needs servinfo.dat? Does the EFB needs servinfo.dat? All required data is in the file vatsim.dat in the 'C:\Users\<username>\Documents\AivlaSoft\EFB2\Client\Online\Vatsim' folder. I see this ebntry in the FSUIPC install log: "Attempt to set the ACL entries for Modules access permissions failed, error = 1332" Could this be the cause of not seeing active ATC and freq's on the client? please ask this question in the FSUIPC forum. I don't have an idea about the content of this logfile. I am sure you find me annoying but installed ny registered version of EFB v1 again there I can see the active FIR's!. So why can't I see teh active fir's in EFB v2? I tried a lot. My next step will be buying a new samsung 1tb ssd install Windows 10 on that SSD and reinstall all programs I have on my computer. Perhaps EFB v2 will work then as advertised? 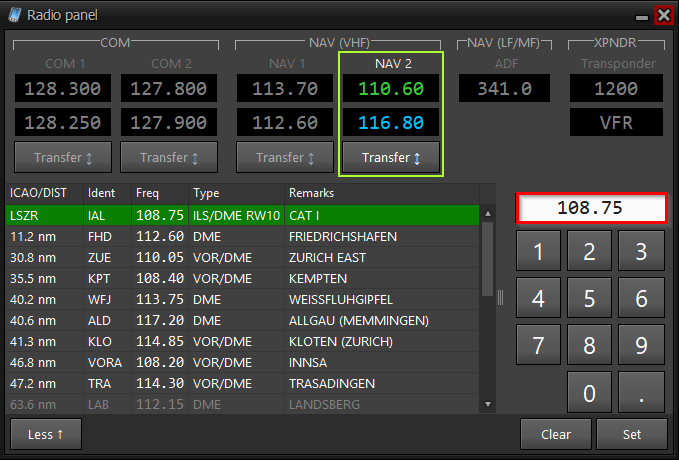 2) In the Client settings (tab 'Global') select VATSIM as your Online Data Network, then press 'OK' and wait some seconds. Well, just as a comparison what EFB v2 shows today 1t 17:47 UTC. 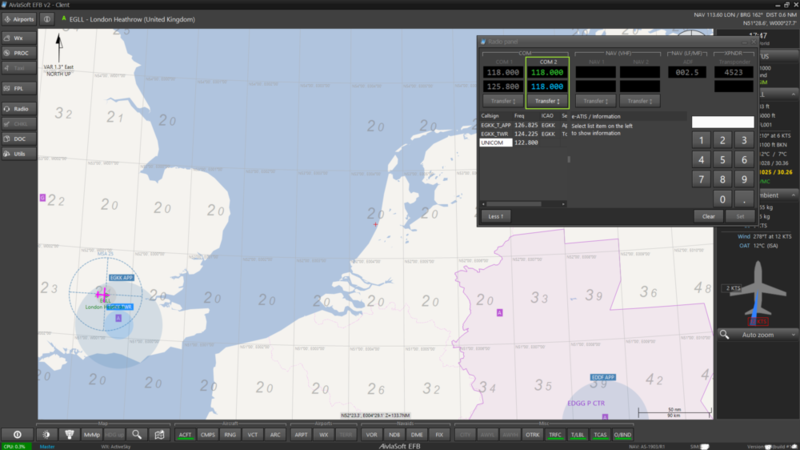 So EFB v2 is definitely able to show all available online data. Could you please report timestamp and size of the "downloadVatsim.tmp" file, or even better, can you upload it here? The location is not of any importance as long as everything on this different disk has unlimited access. I appreciate your answers but I afraid I can't make it clear what my problem is. I can,t select a frequency because the set button is not clickable. The button remains grey. When I double click the only visible freq (left side of the Radio panel 122.800. it is transferred to above but the freq is then shown as 122800,000. Could this be the cause of not displaying active FIR's and Freq's? May I ask what sreen-capture Utility you are using? are your regional currency settings set to a comma rather than a decimal character ? If all else fails please try setting your regional settings to English just to see if that cure the problem. Great! Thank you very, very much😀 I had the regional currency settings set to a comma rather than a decimal character. So changed the comma into a decimal character and all is normal now. So changed the comma into a decimal character and all is normal now. Do you mean that the download and depiction of the FIRs is also working now? Yes it does😀 Thank you as wel for taking the time and effort to help me.